Spotlight 11 (Английский в фокусе. 11 класс) Книга для чтения. Гамлет. Афанасьева О.В. и др. 4-е изд. - М.: 2017 - 72 с. 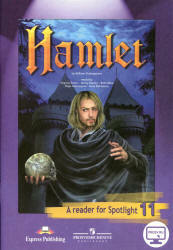 The Tragedy of Hamlet, Prince of Denmark is one of Shakespeare's most well-known plays. Shakespeare wrote it between 1600 and the summer of 1602. Hamlet is performed more often than any other Shakespearean play in almost every western country and it has been translated into every major language. In the theatre, performing the full play takes around 4 hours, and it is because of this that most theatre companies use a shorter version of the play. Most actors find it very difficult to play the part of Hamlet. Not only does the character have more than 1,400 lines, but he is also a character with a very complicated and controversial personality. His troubled mind is balanced by his clear judgment. His indecisive and hesitant nature is balanced by his rash and impulsive acts.